Kobo’s new waterproof e-reader opens for preorder on October 16th. October 3, 2018 - by Deric - 3 Comments. 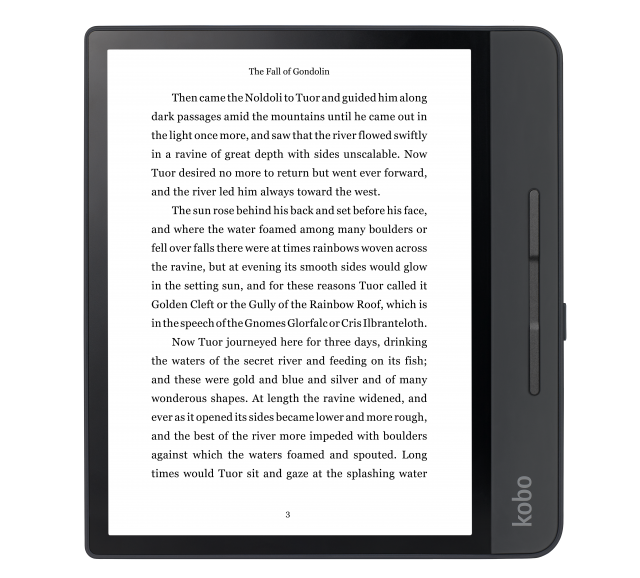 Kobo has announced its new Forma e-reader, which will be available for preorders beginning October 16th. An image of the Forma first appeared last month when Kobo’s Spanish Twitter account tweeted and then deleted a rendered photo of the e-reader. The new Kobo Forma sports an eight-inch display and weighs about 15 percent less than the Kobo Aura ONE. It might be a little lighter, but there are a lot of similarities between the Forma and Aura ONE. Like the Aura ONE, the Forma meets IPX8 standards — meaning it can be submerged for up to 60 minutes in up to six feet of water — uses the ComfortLight PRO system, which adjusts blue-light exposure throughout the day, and has a storage capacity of 8GB. There will be a version of the Kobo Forma with 32GB of storage, but that is only coming to Japan for now. Kobo says it will be available in other countries at a later date. The Kobo Forma will only be available in black and will be priced at $279.99 USD. Preorders will start October 16th, and starting October 23rd, the Kobo Forma will be available in stores and online in Canada, the US, the UK, Italy, the Netherlands, France, Japan, and Spain. The Forma will also roll out to Australia, New Zealand, Switzerland, Sweden, and Turkey later this year, and Mexico in early 2019. Previous Article Augmented Reality Photos: Just like the portraits at Hogwarts!